Elegies uses part of a poem titled Elegy on the death of the mother of Saif al Daula, written by al- Mutanabbi in the year 948. Although written by the great poet in an age seemingly vanished and separated from the car bombing on al- Mutanabbi Street in Baghdad by more than a thousand years, the words remain very moving and speak powerfully to the universal themes of mourning and the futility of violence . I echoed these lines with words by an imagined poet in 2007. A poet who I imagined might be like a young person who would frequent a street of booksellers. A poet with a potential to see beauty; to speak. 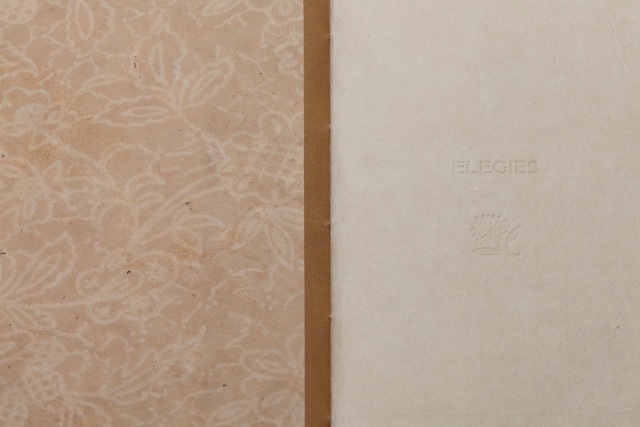 The book is pamphlet stitched, mounted between boards with a fold out, bees-waxed drawing. The materials and the quiet greys and tans of the papers are intended to convey an elegiac tone and reflect the desert imagery and passing of the ages;To mourn the loss.To remember, in spite of all the pain. Medium: Letterpress on various shades of Moriki paper with beeswaxed drawing. Covers of original drawings on Kozo and unryu paper covered boards and japanese cloth with gold foil stamping.